This is the place to be, the rave scene that is. In this generation, awesome outfits made for the misfits, illuminating lights, loud banging music, and bracelets made with love is what its all about. Everyone feels exhilarated and alive at these events. Don't miss out on the party of your lives. 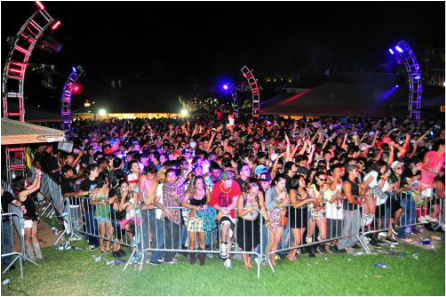 We can pick you up and take you to any of your rave events on the island of Oahu. We'll also take you wherever your heart desires afterwards. Party in absolute luxury and do it right in a party bus limo. Here at Luxury Party Bus Hawaii, we are all about the party! The more the merrier. Louder and crazier is just more fun. But we also take safety very seriously. Let us take you and your best round of friends to and from raves safely and securely. Dont think for a second that the party ends at the rave event. You and your entourage can keep on shuffling into the bus and continue the party on the road!